Download our New PetDesk App for your Pet! We try to make things as easy as possible for our clients, which is why we are proud (and VERY excited!) to announce you can now download the PetDesk App and have everything regarding your pet available at your fingertips! See when your pet is next due for vaccines, request an appointment, create tasks/reminders for yourself, upload pictures of your pet under their profile page, keep track of rabies tags or microchip numbers in one place, receive reminders for everything pet related, get an alert on your phone when your pet is ready to go or even see pictures of them when they are staying here at the hospital. The benefits of the App are incredible and it keeps you in better touch with your pet’s health care (plus, it’s a much easier way to make an appointment)! 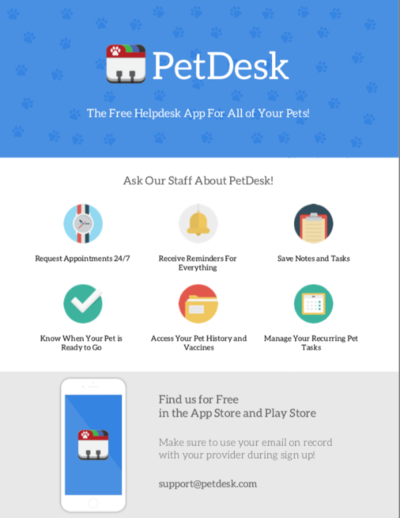 Find the PetDesk App FREE in the App Store (on iPhones) and Play Store (for Androids). Make sure to use the email address that we have on file here when you sign up – that ensures all your pet’s information transfers to your phone. If you have any questions, feel free to call and ask. Don’t want to try the App? We’ll still email you any upcoming reminders. But try it out! It’s fun, easy and free!